I was in a funk all last week. I went to the dark side with my thoughts and felt crappy about myself. I was being extremely judgmental about where I am with my life and business and I wasn’t being very compassionate to myself. It’s a cycle. One that needs to be addressed at the core of my beliefs system. Like many people, I’ve been operating on an outdated belief system. A belief system that I created from an early age, before I was able to know any better. I interpreted past experiences to mean that I wasn’t enough and I’ve been running the “I’m not good enough” operating system in the background of my life for a long time. I’ve been working on these limiting beliefs for years and they still creep in from time to time. I know intellectually that my false beliefs are only stories that I tell myself. They’re not true yet they feel so true in the moment. In the midst of my story last week I could say out loud “I know this isn’t true but it’s how I’m feeling”. And instead of pushing it away, I honored that feeling. I realized I’ve been going it alone for a long time. One of my stories is that I can and should do everything myself. I realized this one woman show needed support and I reached out to several people in my life. I vented, I cried, I listed all the reasons I AM good enough. It was exhausting and exactly what I needed. So how do we rewrite our outdated limiting core beliefs? First we honor them and give them a voice by sharing how we are feeling and allowing the emotions to flow through us. When we don’t express our emotions they get lodged in our body and create problems down the road. Saying the fear or negative belief we have out loud gives it much less power. Another tool I’ve used in the past to help me maintain a more positive mindset is a gratitude journal. For several months I would journal 3 things I was grateful for at the end of each day. It was a great practice and I was in an awesome place mentally. Having a gratitude practice is so important. Ha, even science says so! Research shows that people who express gratitude regularly are happier, healthier and feel more supported than those who don’t. It also improves self-worth and builds more stress resilience. With all that I know about the importance of a regular gratitude practice, it’s time to add that back to my routine. Join me as I commit to 31 days of a regular gratitude practice. 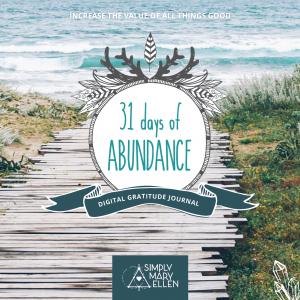 To make it easy I’m gifting you a 31 Days of Abundance Digital Gratitude Journal. Simply download it to your computer, click in each box daily and type in the 3 things your grateful for. Commit to this practice to improve your thought patterns, spread appreciation everywhere you go and create more abundance in your life. That’s my hope for you and me. Let’s do this! Cuz after all, what you appreciate appreciates! Let’s increase the value of all of the good things in our life and decrease the room for internal judgements and feelings of “not good enough”. Download your Gratitude Journal now! Then connect with me on Facebook and Instagram to share what you’re grateful for and all the abundance you’re creating.